Vodka with dangerous chemicals has been found in the UK and an Irish watchdog has said people in this party season should be vigilant about where they get their alcohol. Fake vodka seized in Nottinghamshire. AS PEOPLE ACROSS the world prepare to ring in the new year with a bang, revellers in the UK have been warned by the Trading Standards watchdog about dangerous counterfeit vodka being sold on the streets. The Mirror reported yesterday that thousands of bottles of this ‘deadly fake vodka’ were discovered in several locations around the country. The drink contains seriously dangerous chemicals and the public is being warned to stay away from it. 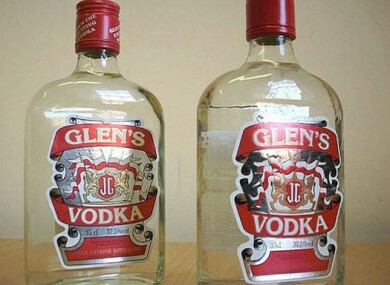 Worryingly, this counterfeit vodka was seized in a number of stores in Luton recently. In that particular case, samples were found to contain “dangerously-high levels of isopropanol, commonly used as an industrial solvent, and butanol which is used in paint remover”, according to The Telegraph. There have been a number of seizures of counterfeit vodka in Ireland in the last year and the Food Safety Authority of Ireland (FSAI) last December issued a guide on how to tell the fake vodka from the real deal. Today, a spokesperson for the authority told TheJournal.ie that the FSAI is “aware of what is happening in the UK”. They said there is currently no evidence that this particular counterfeit vodka has made its way to Ireland. However they stressed that “consumers should be savvy and only buy alcohol from reputable sources”. “If something seems very cheap, it’s probably too good to be true,” they added. Email “No evidence 'deadly fake vodka' has arrived in Ireland but be careful what you buy”. Feedback on “No evidence 'deadly fake vodka' has arrived in Ireland but be careful what you buy”.